Ready to design and publish an ad in Mailchimp's Ad Builder? First, read these tips to help optimize your content for Facebook and Instagram. 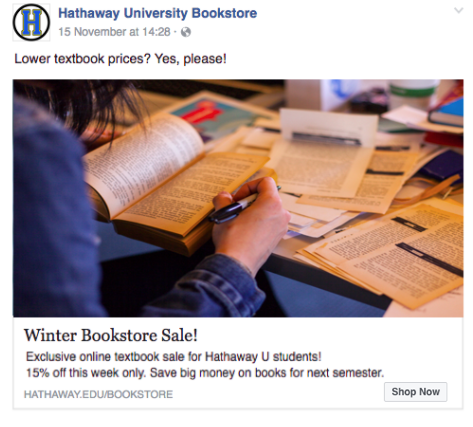 In this article, you'll learn important design tips for Facebook and Instagram ad content. In the Content step of the Ad Builder, you'll design your ad's text and visual content. Your Page Name You're all set here. We'll automatically show your connected Facebook Page or Instagram handle. Message Create a message for people who view your ad on Facebook and Instagram. Image Insert one or more images in your ad. Choose one GIF or static image, or add multiple static images for a carousel ad. Title Create a title for your ad to let people on Facebook know what you're advertising. Instagram won't use this field unless you run a carousel ad. Description Add a short description of what you mentioned in the Title. This field is visible on Facebook ads only. Link to Provide the URL that you want to drive traffic to, based on your Title and Description (like a product page, company website, or email marketing signup form). This cannot be a link to a Facebook page, or your ad will be rejected. Button Choose a call to action button to connect to your Link to website, such as Learn more, Sign Up, or Buy Now. 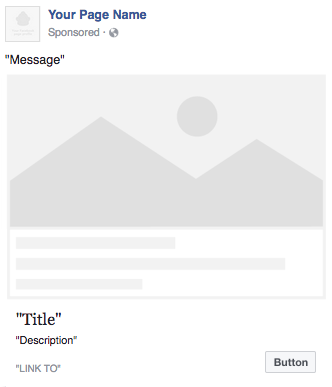 Here's a blank Facebook ad that illustrates the customizable sections in your ad, such as Page Name, Message, and Link to fields. After all those content sections are customized in the Ad Builder, here's what a finished Facebook ad might look like. Here are some tips that can help make your ad successful. Choose your images carefully. Try a photo of someone using your product, instead of the item alone. Your ad will display in feeds alongside updates from viewers' family and friends, and this can help your ad feel like it belongs there. Minimize text in your images. Your ad will be rejected if an image has 20% or more of its pixels dedicated to text. Take a look at Facebook's examples for guidance, or test with Facebook's grid tool before you upload your image to Mailchimp. Ask yourself, "If I glanced at this ad for a few seconds, would it be easy to understand?" If not, try to simplify your content. Test out different types of ads. Mailchimp's Ad Builder helps you create ads with one GIF or static image, or carousel ads with up to five different static images and calls to action. Try each option and see which one your audience likes best. Avoid all caps and lots of exclamation points. Facebook may reject your ad if it contains all capital letters, too many exclamation points, or spammy language. High-quality images that are about 1200 x 628px work best for single-image ads. Use square images that are 1080 x 1080px for carousel ads. Proofread your ad before submitting. After you submit your ad, you won't be able to edit it. Ask a friend or a colleague to check it for mistakes before submission, just to be safe. Social networks can be very particular about the ads that they'll approve. Mailchimp can't change their policies or override their decisions, but you can educate yourself by reviewing and following Facebook's ad requirements. Instagram is owned by Facebook, so their policies also apply to ads you run on Instagram. So far, we've found that certain words and phrases have additional restrictions on them, and may pose a higher risk of rejection if you use them in your ad. This doesn't mean that you can't sell certain items like alcoholic drinks with ads. If your product isn't restricted and your targeted audience is age-appropriate for your advertising region, you should be OK. If not, Facebook reserves the right to reject your ad. For more about ad rejection errors and how to resolve them, read our resource on Facebook Ad Submission Errors. Now that you know the basics of ad design, give it a try! Learn how in our step-by-step tutorial, Create a Facebook or Instagram Ad with Mailchimp. Learn the basics of how to set up your ad, send it to Facebook or Instagram, and view results without ever leaving your Mailchimp account. In this step-by-step tutorial, you'll learn how to create a social media ad in your Mailchimp account. Also learn how to pause or cancel the ad. There are things that happen after you submit Facebook and Instagram ads. Learn about approvals, rejections, errors, and how to resolve issues.